For some, Freemasonry is an institution that has been shrouded in the shadows but, here in Canada, its influence is all around us. But the Aurora Historical Society and Aurora Museum & Archives aim to help shed light on some of the mystery this month with Freemasonry: A History Hidden in Plain Sight, a travelling exhibition that opens this Saturday, February 9, at Hillary House National Historic Site. Curated by the Bruce County Museum & Cultural Centre, the exhibit was designed to promote the knowledge, appreciation and understanding of masonic history, as well as its influence on society today. The exhibit tackles Freemasonry right at its roots, from its known beginnings, to its establishment in Canada, and how lodges, such as Aurora’s Rising Sun Masonic Lodge, continue to flourish today. Ms. Baird took her first trip through the Rising Sun lodge, which is located at the southwest corner of Wells and Mosley Streets, this past August and while she says she was really excited to go through their doors for the first time, she was even more excited to see all four doctors well represented on their walls. 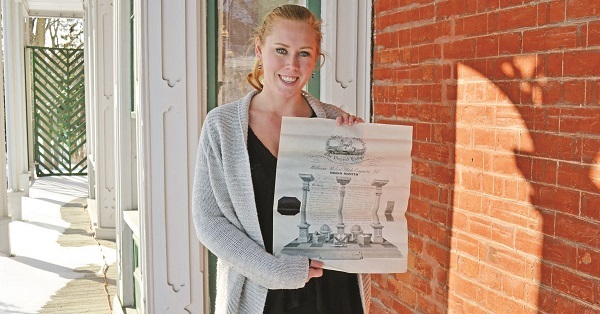 For a time, she says, these Lodges were one of the best ways for individuals – in the case of the Masons, men – to network and make connections. Ahead of Saturday’s opening, Ms. Baird and the crew are looking forward to unpacking the exhibition once it arrives from its current display in Owen Sound and discovering just what treasures await Aurora viewers. “We hope to show how it began and how it came to Canada,” says Ms. Baird. “It was very important in early Canadian settlement life, particularly when coming to a new Town and making those connections. Becoming a member of such a close-knit club was a way to get involved and meet the who’s who of a Town. Almost every Town had a lodge and I am interested to know how they started, came to be, and how they spread. There is a lot of lore and mystery around Freemasons and how they were the movers and shakers of the New World, and I think people will be interested to see that. Freemasonry: A History Hidden in Plain Sight opens at Hillary House this Saturday, February 9 with a reception from 1 – 3 p.m. The exhibition will be in Aurora through April 26. For more information, visit www.aurorahs.com or call 905-727-8991.